On Jan. 17, a massive U-shaped floating marine device arrived in Hilo Harbor to begin repairs. 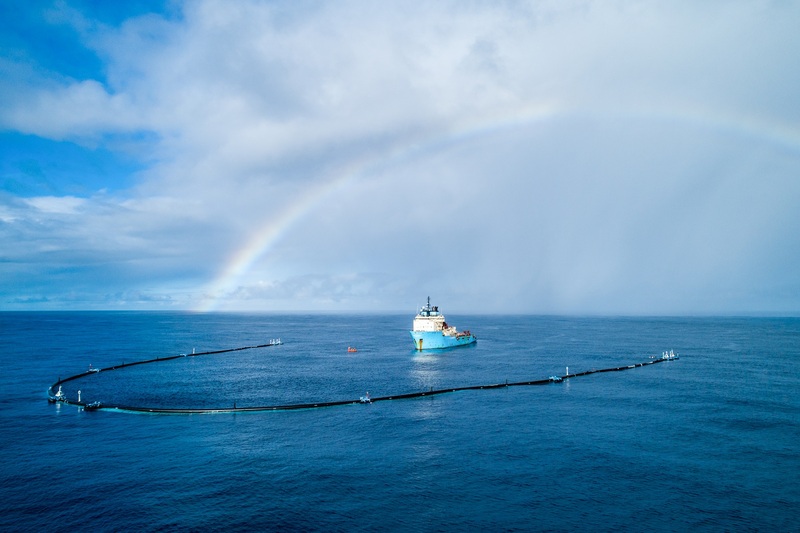 The boom is System 001, a 2000-foot boom launched by a Dutch environmental nonprofit called The Ocean Cleanup. Invented by the nonprofit’s founder, Dutch inventor and entrepreneur Boyan Slat, the unmanned system was tasked with cleaning up plastic in the Great Pacific Garbage Patch where, caught in gyres that flow toward it, millions of tons of discarded plastic and other debri arrive every year. By deploying a 10-foot-deep net under the U-shaped floater, the boom acts as an artificial shoreline that collects the swirling debri. On Dec. 29, the support crew of System 001 discovered that an 18-meter end section of its floater had fractured off of its body. In a press release, The Ocean Cleanup stated it believes the malfunction was due to metal fatigue and stress concentration, but must investigate further. The malfunction comes amidst another issue the system has encountered, which is the lack of trash retention in the system’s net. According to The Ocean Cleanup, when an ample volume of plastic is collected in System 001’s net, it’s transported back to land and the plastics are sold to recycling firms. With the funds from the sale of these plastics, The Ocean Cleanup plans to expand their fleet of systems. The system was deployed in September 2018 from San Francisco Bay. As the “001” implies, it is the first beta cleanup system that The Ocean Cleanup has launched. According to their website, the nonprofit estimates that it will be able to aggregate up to half of the Garbage Patch in five years. No comment has been made about how the malfunctions may affect that timeline. In early February, UH Hilo Agriculture student Louis Antonelli and a friend noticed the boom sitting in Hilo Harbor. He told Ke Kalahea that he was moved by learning about The Ocean Cleanup’s goal and current difficulties, so he reached out to System 001’s offshore operational manager Rick Martini via email to volunteer his help. Antonelli passed on this information to the head of UH Hilo’s Marine Science Department, Dr. Steven Colbert, and a correspondence between the two organizations ensued. “I thought it was wonderful that Louis reached out to welcome this group to Hilo,” said Dr. Colbert in an interview with Ke Kalahea. Through sharing the emails, other UH Hilo departments such as Computer Science joined in to inquire ways to help The Ocean Cleanup. The Ocean Cleanup compiled a list of opportunities and needs they had for the various departments. Now, said Colbert, they are trying to figure out where UH Hilo’s staff and students can be of service in accordance. The difficulties System 001’s crew is dealing with could be beyond the expertise and resources available to UH Hilo, noted Dr. Colbert. “The challenge of Hilo is always getting supplies and qualified personnel – that could be something specialized like underwater welders, for instance.” It is still unclear what role, if any, UH Hilo’s personnel will play in helping with the actual repairs. Still, Dr. Colbert is optimistic to use the system as a learning activity for his class. Weather conditions have added to difficulties in that effort. The Marine Science Department had planned on taking a class out on Feb. 13, but a rain storm and high surf prevented them from taking their research boat out to the system, which is only reachable by watercraft. Still, Dr. Colbert is optimistic the collaboration will happen before System 001 departs again. When asked about why it was in the Marine Science Department’s interest to seek involvement with The Ocean Cleanup, Dr. Colbert talked about the dangers of ocean plastics. “Marine debris is a serious issue. There is so much of it out there, but now there is a new source: plastic. The harmful impact on our ecosystems is a problem we need to address from all angles.” He added that, from his perspective, getting harmful plastics out of the system was the best way to prevent the harm caused by plastic once discarded. The repair schedule of The Ocean Cleanup is still unclear, though Martini wrote in his reply to Antonelli that the repairs are estimated to take anywhere from a “few weeks to three months.” Ke Kalahea will continue to provide updates on this story as news of the repairs comes in. In the meantime, System 001 will be on vacation from cleaning anything, right here in Hawai`i’s Hilo Harbor.